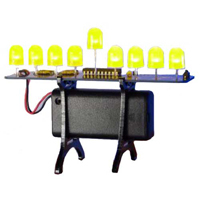 Our Deluxe LED Menorah kit is an updated take on the traditional hanukkiyah, the nine-armed Hanukkah candelabrum. Two candles are lit on the first night of Hanukkah (one "real" candle plus the lighter candle, or shamash), three on the second night, right up to nine on the eighth night. (That's (2+9)*(8/2)=44 candles all together, for those of you keeping score.) Ours works pretty much the same way, but uses less wax. When you turn it on, it displays the correct configuration of LED "candles" for a given night of Hanukkah. Each time that you press the button (or switch it off and back on), it displays one more light than it did the previous time that you turned it on (unless it showed all nine last time, in which case it goes back to two). The LEDs are lit up in the traditional sequence, with a gentle fade. You can also easily switch (by a button press) between having your LEDs steadily on, or gently rippling with in our new "candle flicker" mode.